In this knowledge base article (which is expanding all the time) we'll walk you through how to use the new WYSIWYG editor. Here's the quick links to the various functions of how to use the editor. Highlight the text you want to Bold then click "B". Highlight the text you want to Italicize then click "I"
Highlight the text you want to Underline then click "U"
Step 1: Highlight the text you want to make into a Hyperlink. Click on the icon that looks like chain links. Step 2: A new mini-popup window will appear. Type or paste the URL of that you'd like subscribers to go to after they've clicked a link in your email. Once finished then click OK. 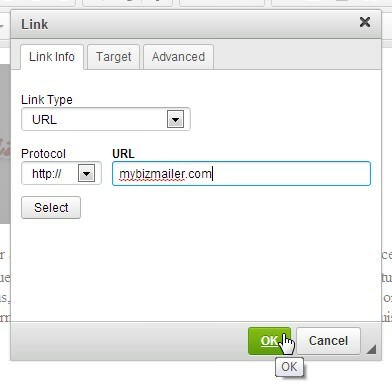 Highlight the link you want to "Unlink" then click the "Unlink" icon. Step 1: Click on the "Image" icon. Step 2: A new mini-popup window will appear. Click on the "Select" button. Step 3: A new window will appear. 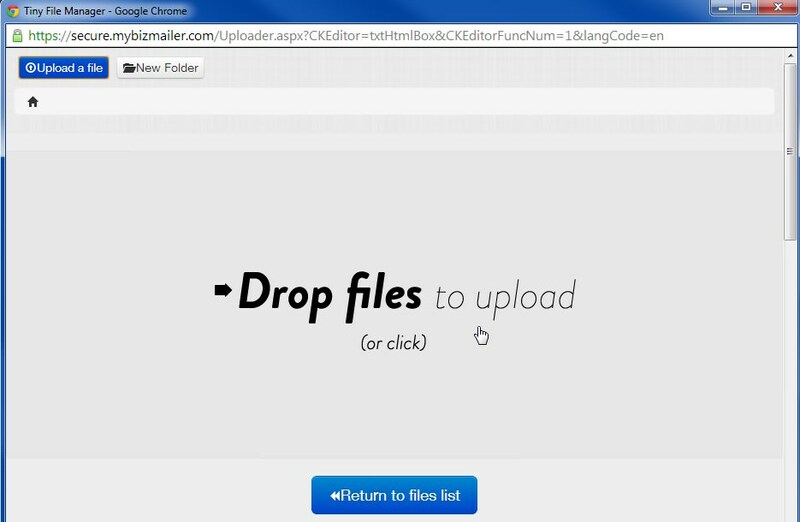 In the upper left corner you will see an "Upload a file" button. Click on the that. Step 4: The Screen will then change to look like the screenshot below. You can either Drag and Drop your files to the middle of that window. 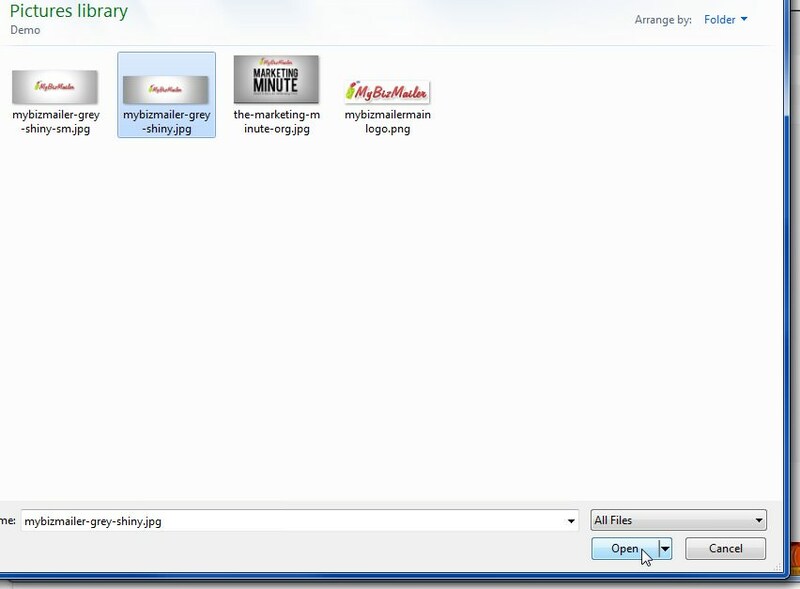 Or you can click in the middle of that window and locate your image file. Step 5: A new window will appear. Find your image → click that image → then click the "Open" button. 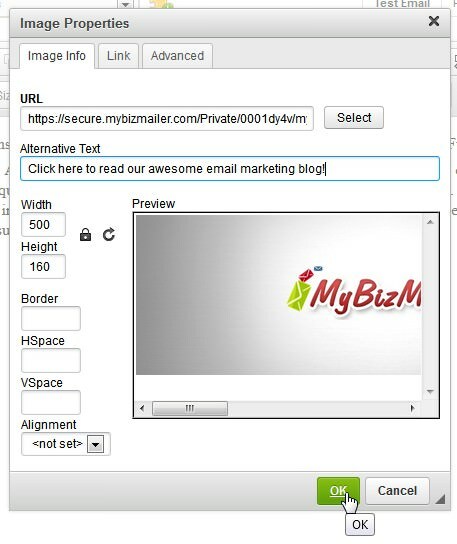 Step 6: Your image file will now upload to the MyBizMailer server. 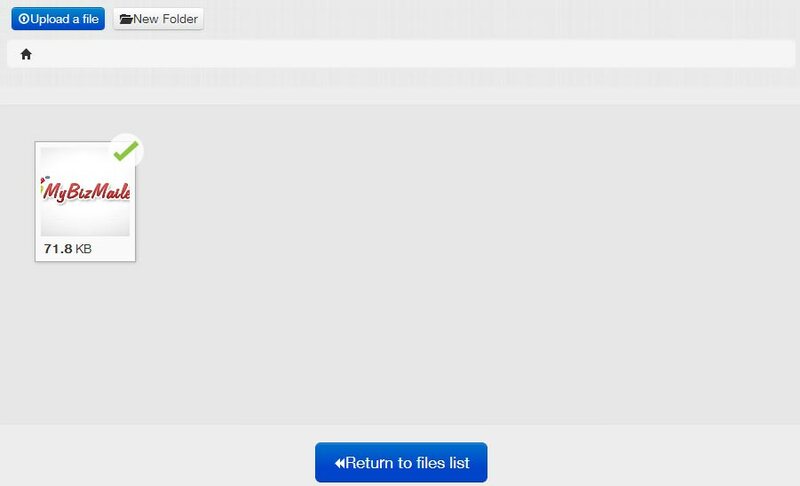 → Click the "Return to files list" button. Step 7: Locate the image you just uploaded → then click it. Step 9: If you'd like your image to be clickable then → Click the "Link" tab in the "Image Properties" window → Type or past the URL that you'd like your subscribers to go to if they click the image → Click the "OK" button once you're done. Step: 1: Click on the image. It should then turn blue like you see below. Step 2: Click on the chain link icon. Step 3: Type in your link information into the "URL" input area → once finished click "OK"
Step 1: Highlight the text you want changed and click on the icon. A color palette display will appear → click on the color you'd like your text to be and Voila! Click into your message where you want the Horizontal Rule to be then click the "Horizontal Rule" icon. Step 1: Click and area with the body of your email then click on the "Table" icon. Step 2: A pop-up "Table Properties" window will appear. 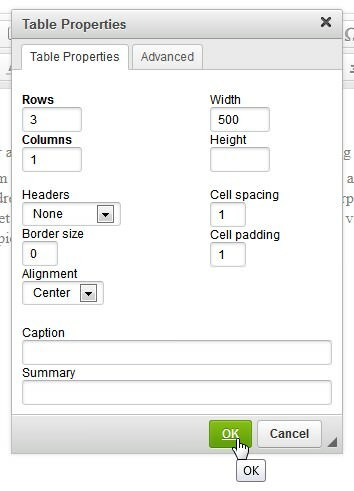 On this screen you can set various elements like the number of rows and columns, width, alignment and more. Once you've finished setting the properties click the "OK" button to insert the table into your email. Result: Below you'll see an example of a table after it's been inserted into an email and I've clicked on it. 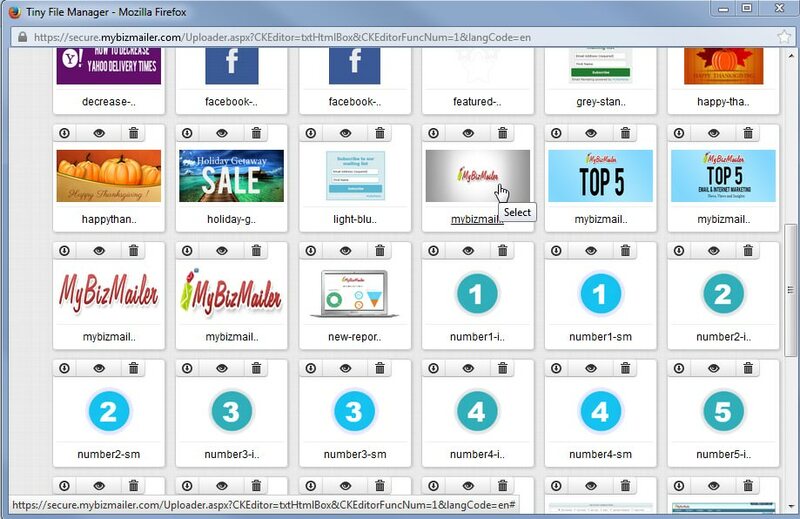 Remember at the start of this Knowledge Base article where we recommended that you use Firefox to unlock the Full experience of the New WYSIWYG editor? Well this is one of the those times where using Firefox gives you additional freedom. For example: When I click on a table that's within an email while using firefox I get those teeny tiny boxes that'll help me to resize the table by dragging. In Chrome and various other browsers your won't be able to see or use this type of functionality. Sometimes you need a little breathing room to create your email marketing campaigns. And if that's the case for you why not use the WYSIWYG editor's ability to go into Full Screen mode. Click on the "Maximize" button. You will then go into "Full Screen" mode. To return to the "Normal" viewing style just click on the "Maximize" button again. Some people like to start creating the content for their newsletters in Word. If you're one of these types of users then here's how you can easily and safely paste your content into the WYSIWYG editor. Step 1: Click an area within your email that you'd like to paste your content then click on the "Paste from Word" icon. Step 2: Copy your content from word and paste it into the mini-popup window that appears then click OK. After you click "OK" your content will appear in your email. 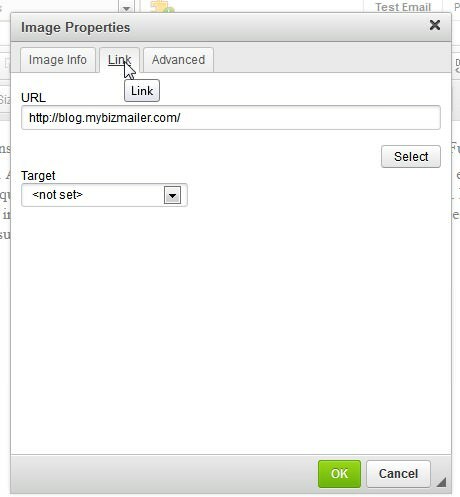 Please note that pasting content with images into the WYSIWYG Editor will not automatically import those images into your email. 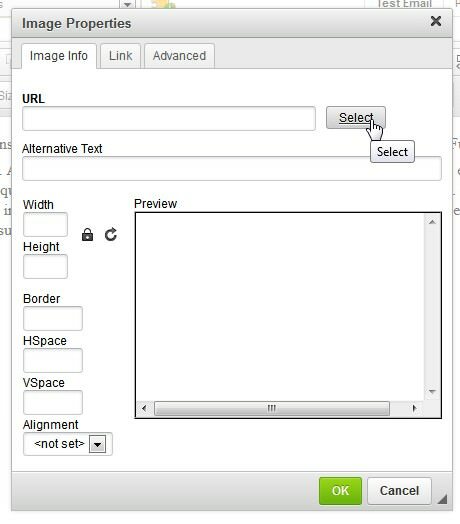 You will see have to import the images you want in your email campaign seperately.